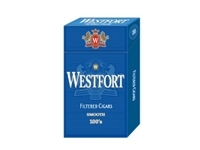 Westfort Light Filtered Cigars come in 10 packs of 20 filtered cigars each. They have a bite not really smooth. The worse part is they are very hard to keep lit if not constantly drawing on. Also the filters are glued or attached securely and come off in your mouth when you try to light them. For the price, these are good. However, they have a bite to them and are not a smooth tobacco.